Ka’wi The Gorger is one of the Beasts of Fable in Book 1, along with Kafi, Dos-Ryga and Nitun. He’s quite a bit more predictable than either, and relatively easy to beat. The strategy I put forward for Nitun also works here, but I’m going to discuss some other, different tactics for Ka’wi. Because Ka’wi is easier to beat, this is more of a team building post than a specific breakdown of one strategy. 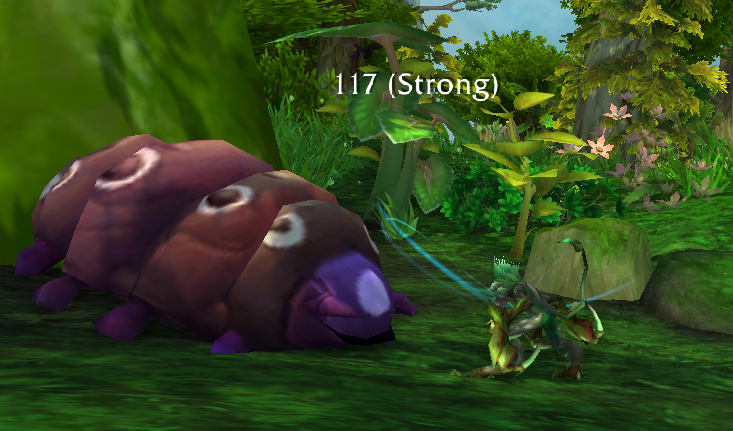 Before we discuss the actual pet battle, let’s talk about how to get there. For some reason, I am perpetually getting lost trying to find Ka’wi. 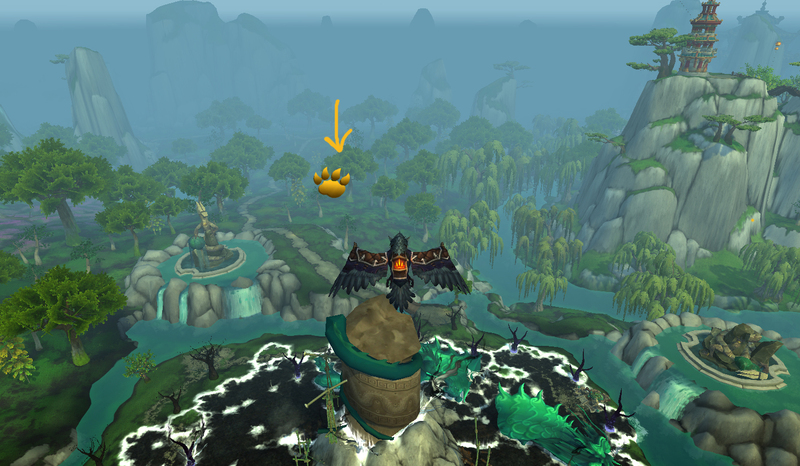 If I do though, all I have to do is find the Jade Serpent Statue in the Jade Forest and look directly South. Between the road and the river is where you’ll find Ka’wi. In fighting Ka’wi, you have a couple options. His offense is a mix of Critter moves with Chew and Flying moves with Moth Balls, so my first inclination in team building was to use a Humanoid team, because they defend against Critter moves. 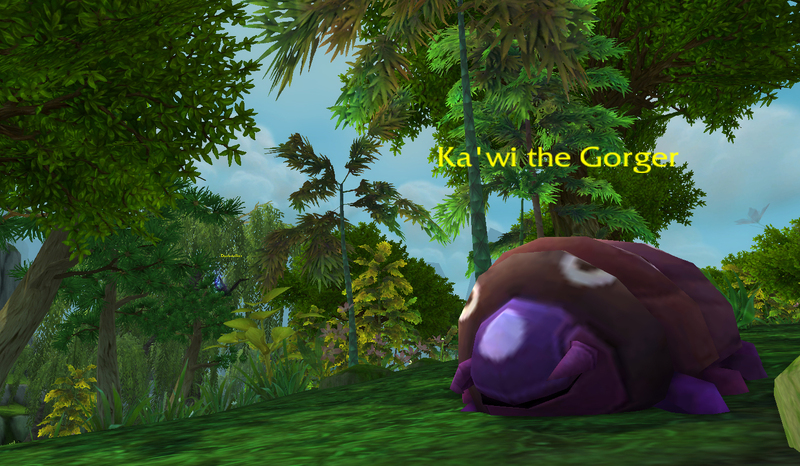 Most humanoid battle pets have really strong offense when paired with stuns and unfortunately, because Ka’wi is a Critter, he’s going to be immune to all of these. Chew is on a relatively short cooldown, but has a ramp up, so my personal prerogative is to go with something to just avoid this when possible. The Anubisath Idol, Bonkers, the Flayer Youngling and Lil Bad Wolf are all humanoids with either Dodge or Deflection. The latter 3 also have Beast moves, which hit the critter Ka’wi extra hard, making them the better choices if possible. Because the other half of his offense is Flying another simple counter is to use a Dragonkin. Fortuitously, many of these dragons also have avoidance in the form of Lift-Off, which is easy to employ, because Chew’s damage hits at the end of the round, when DoTs do. 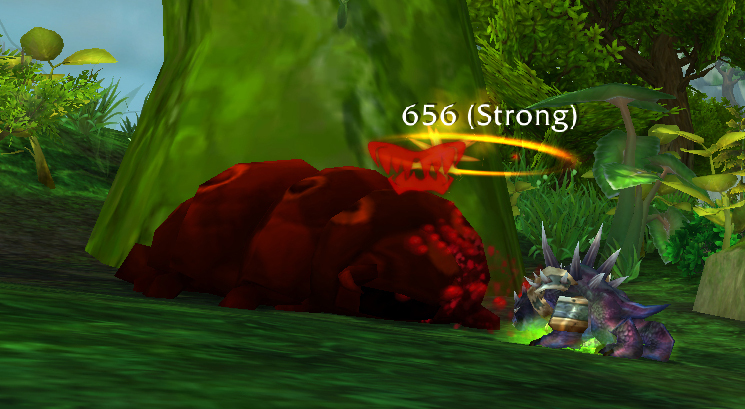 Many Dragonkin battle pets also use Beast attacks, which is fantastic for Ka’wi. Of particular interest are those that combine both the avoidance and beast damage, namely the Phoenix Hawk Hatchling and Proto-Drake Whelp. There are a couple others that do as well, but by using Roar, which isn’t really effective in the ‘beast damage’ conversation. 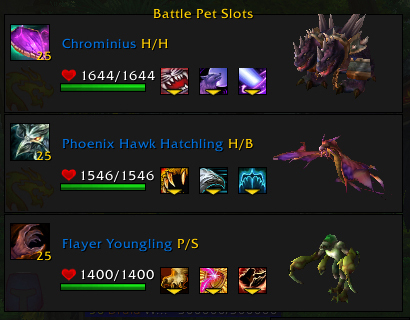 The Untamed Hatchling and Chrominius combine beast damage with heals, which is also fairly effective. Chrominius’ Howl option makes for a much stronger offense, which is able to rip through Ka’wi like a hot knife through Fudgie The Whale. Here’s my preferred team for Ka’wi. I lead with Chrominius because of the previously mentioned Howl offense. I usually like to frontload my offense, because it makes it easier to tell how the fight is going to go. The Phoenix Hatchling and Flayer Youngling both have good defense. I like mixing up the families just because it’s a good habit to foster. The reason why it’s generally better to go piecemeal here rather than develop a specific strategy is because of Ka’wi’s one ability we haven’t discussed yet. He’ll cast Super Sticky Goo fairly frequently, which restricts swaps. This puts a bit of a damper on a lot of different synergies, so it makes more sense to just evaluate on a per-pet basis. This entry was posted in Beasts of Fable and tagged beasts of fable, strategy on March 14, 2014 by Liopleurodon. I started pet battling in December and this is by far the best explanation I’ve seen for this fight. The strategy I’ve been using works, but it can breakdown if Ka’wi performs a move I wasn’t able to anticipate, which can happen since the Beasts of Fable are a lot more random then many of the other PvE encounters.